Pancreatic ductal adenocarninoma (PDA) is one of the most aggressive human cancers with a median survival of 6 months after diagnosis. Most patients present with locally advanced or metastatic disease and the current standard of care produces only modest survival benefit. One of the main features of PDA is the presence of a predominant stromal compartment. Pancreatic stellate cells (PSCs) are the main fibroblastic cell type in the stroma and support pancreatic tumorigenesis. During tumor progression, PSCs evolve into activated and proliferative myofibroblast-like cells that synthesize copious amounts of extracellular matrix (ECM) proteins and have diminished lipid storage capacity. They produce a dense fibrous stroma that obstructs intratumoral vasculature to create physical and biological therapeutic barriers. These observations suggest that strategies to reprogram the aberrant stroma may enhance anti-tumor treatment strategies. P53 is a potent tumor suppressor and its cell autonomous functions in the epithelial component of cancers are well known. Importantly, recent studies show that p53 activation in the stroma cells induces secretion of factors that inhibit tumor growth and malignant progression. Interestingly, activated PSCs in pancreatic cancers encode wild type p53, raising the possibilities that p53 activation could prevent their proliferation, and induce other paracrine anti-tumor effects. 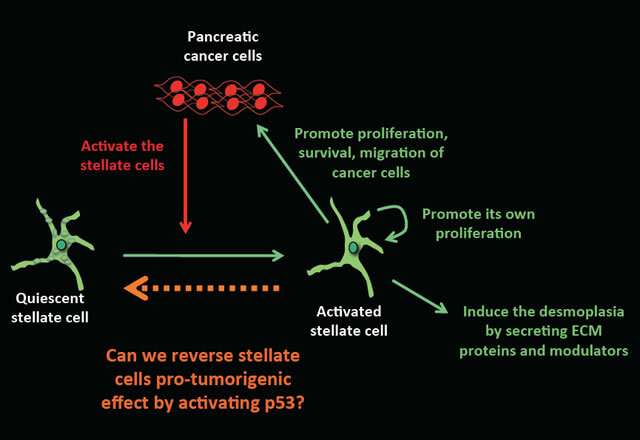 We are currently testing this hypothesis in the laboratory and investigating the potential of stromal p53 activation for pancreatic cancer therapy.